The UC San Diego women’s basketball team defeated the visiting Dominican University of California Penguins 81–58 on Friday, March 15 at RIMAC Arena to advance to the round of 32 of the NCAA Division II tournament against the Azusa Pacific University Cougars. The Tritons and head coach Heidi VanDerveer knew they had a tough matchup coming against the Penguins. The no. 8 seed in the West region was led all season by the nation’s leading scorer in Div. II, senior forward Natalie Diaz. Diaz came into the game as one of the main focal points of the Tritons’ preparation. Diaz, who came into the game averaging 26.4 points per game, was held to just 14 points in 38 minutes of play, with most of those coming in the second half. UCSD did more than just defend well inside. The team outrebounded Dominican 46–28, with a 12–5 advantage in offensive rebounding. Junior forward Mikayla Williams, the Division II Conference Commissioners Association West Region Player of the Year, and Hatfield both contributed double-doubles for the Tritons, with Williams scoring 11 points to go with 10 rebounds and Hatfield contributing 18 points and 10 rebounds, including a game-high 6 offensive rebounds. In one of the more unexpected turns of the game, all of William’s 11 points were scored in the first half. UCSD did not need their most prolific inside scorer in the second half, especially in the third quarter, as they seemed to be hitting almost every jump shot they took. To start the second half, the Tritons hit their first five shots from the field, including four from 3-point. UCSD, on the backs of its sharpshooters, senior guard Joleen Yang and junior forward Sydney Sharp, leaped out of the gate to start the second half, going on a 19–6 run to begin the third quarter. The Tritons ended up outscoring the Penguins 31–15 in the quarter on 8-10 shooting from 3-point range, effectively slamming the door on any chance at a comeback by Dominican. Yang ended up leading the team in scoring with 22 points on incredible 6–11 shooting from deep and 8–13 shooting from the field in general. The senior’s incredible performance came nearly entirely in the third quarter, as Yang had only 8 points at the end of the first half. “Their philosophy is if you’re hot keep shooting, and if you’re not hot keep shooting until you are,” coach VanDerveer joked of Yang and the other Triton shooters after the game. 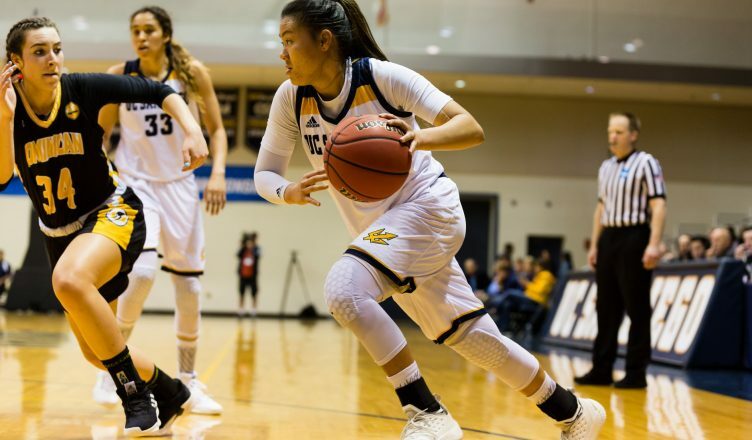 Yang handled the ball for UCSD for much of the third quarter, but senior guard Kayla Sato, who had a very solid game with 12 points, 7 rebounds, and 6 assists, ran the offense for much of the 32 minutes she was on the floor. To cap off her night, Sato came into the game for freshman guard Brianna Claros, who was injured on the previous possession, stole the ball from the Penguins off the inbound and hit a signature 10-foot jumper with just under two seconds left on the clock to drive the score up to 81–56. Sato, along with Yang, was one of the Tritons’ most energetic players, firing no-look passes and cheering loudly on the bench for the few minutes she was not in the game. The energy was not just Sato’s though. The entire team seemed fired up and ready for action even before the game began. Over the course of the game, UCSD played an intense game both on offense and defense, which led to long gaps where Dominican had a tough time putting up points. The quick offense and stingy defense from the Tritons forced some desperation threes from the Penguins, even in the second quarter. This led to UCSD going on three 8–0 runs over the course of the first three quarters. The first came in the second quarter to bring the score to 30–20. From this point on, the lead would never be under double digits for the Tritons. UCSD went on another 8–0 run to end the half, driving the score up to 42–22 heading into the locker room. The host team outscored the visiting Penguins 22–7 in the second quarter, largely due to their pair of 8–0 runs. Besides the consistent overall performance, the most exciting moment came at the tail end of the third quarter, when Claros hit a contested jump shot from outside the key with 1.8 seconds left off an inbound pass to really get the bench and the crowd into it, a moment which seemed to knock any remaining wind out of the Penguins’ proverbial sails. With the powerful offensive and defensive effort, the Tritons demonstrated that they belong at the top of the West region and that their undefeated record, with every win becoming the new best in program history, is no accident. UCSD will take on Azusa Pacific on Saturday, March 16 at 7:30 p.m. at RIMAC Arena. The Cougars beat the California Polytechnic University, Pomona 62–60 on Friday night to earn a chance to play the Tritons.